Genie Living Drinks announced the launch of a new range of live sodas – a first of its kind in the UK – real fruit flavoured sparkling drinks which are low calorie, have no added sugar or other nasties and are good for your gut! 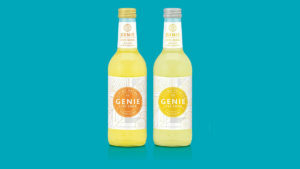 Responding to consumer demand for healthier soft drinks, Genie Living Drinks are real fruit sodas containing only natural ingredients which come in two delicious flavours, Original Orange and Lemon & Ginger. They also have the added benefit of being ‘live’, meaning they contain active cultures which help nourish the gut. Designed with flavour in mind, this new range of live soft drinks is as tasty as any traditional fizzy drink, but without the added sugar, sweeteners or e-numbers. Despite being healthier and delivering incredible Bacillus Coagulens cultures which are crafted by gut experts, Genie Living Drinks don’t have a challenging taste or texture which some other health or ‘probiotic’ drinks can have. Unlike some products containing live cultures, Genie Living Drinks can be stored in ambient conditions and have a long shelf life. The trend for healthier living in the new year gives the ideal opportunity to stock the UK’s first live fruit soda which will be launching with a consumer PR and marketing campaign in Q1. 100% vegan and with only a few natural ingredients, Genie Living Drinks are also naturally low in calories with one serving also providing over half the recommended daily intake of Vitamin C.